mix spread the coriander and cumin evenly on top of tilapia fillets. dash with salt and pepper. fry until golden brown. 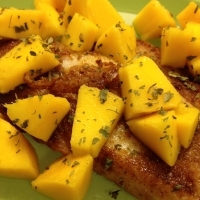 top with cubed mango and cilantro. serve with hot white rice. yum!